Planning is good, but sometimes even the best planning needs some “tweaking” in the real world. Being flexible in field contesting, just as in emergency communications deployment, is the best way to get things done. 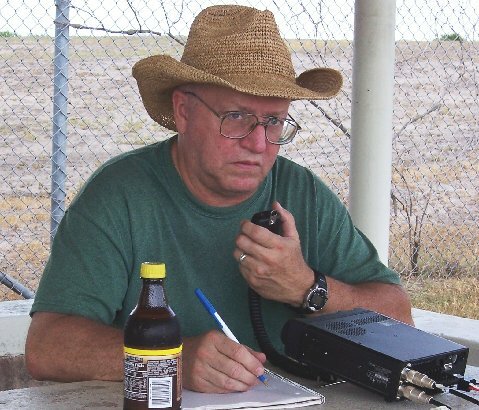 All ham radio operators need the experience of going out in to the field to do this sort of thing. It makes them better operators. 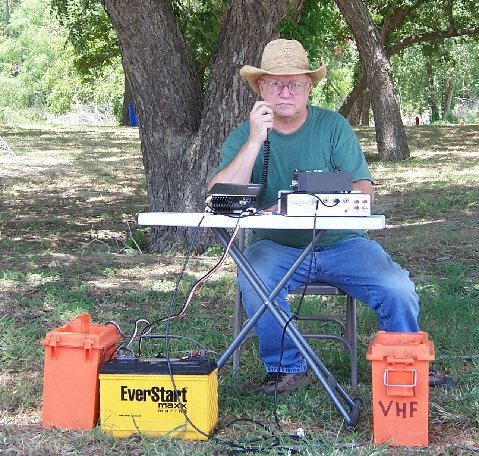 I tend to over pack my truck when it comes to doing ham radio events, and for good reason: You never know what obstacles you might encounter and how to overcome them. However, this time I had a minimal amount of gear and supplies. This was the height of my “daring”. Never again! Driving on the planned route, I headed south to RT 181 because this road lead me to an area where 4 major grid squares almost intersected. My first stop would be near the southeast corner of grid square EL09 (which is also all of San Antonio but in order to be efficient I wanted to be closer to the convergence of the grid squares so I planned to operate from EL09xa) Grid squares can be further broken down in to 6 digit squares, mainly for UHF work where signals don’t travel as well due to line of sight propagation and the curvature of the earth, tall buildings and hills. Note: In this contest you can not park on a convergence line to transmit from two grid squares like you can as a rover in a state QSO party at county lines. Coming south on RT181, I was driving past Floresville wondering where down the road I’d find an adequate spot to operate. The grid square EL09xa was past the town of Poth and finding a spot with flatness and possible height might be a challenge. Then it hit me. Why not operate at a place in Floresville that I knew quite well? I would still be in EL09 but the sub square would make it EL09vc. Pulling in to the park, which was not crowded at all, I had my choice of several areas to park my truck with the antenna system in the bed yet run cables to operate from the shade of rather large trees. This was gonna be a snap! And it was. The cooler breezes made the heat of the day bearable. My antennas went up without a hitch. I used my new telescoping pole and mounted a 5 element (each) dual band (2 and 440) yagi and used an inverted “V” for 6 meters. I was “good to go”. Unlike operating there using MARS HF frequencies, I quickly found that when I rotated my beam towards the Northwest hoping to get any San Antonio op who might be in the contest there was a pronounced increase in electrical noise. It made operating into this area a bit harder. Pointing the beam directly North yielded better results as I quickly made contacts, one being K5QE who was operating from EM31 near the Texas/Louisiana with his powerhouse contesting station from his home. Other stations came and went just like a Texas shower. The bands were a bit stubborn but I did make many contacts. At the time posted I moved down to operate from 6 meters. The band was void of the electrical noise and I managed to make a few contacts. Before long it was time to break down the setup and drive to the next grid square. Although the breakdown went fairly well, I didn’t allocate enough time to do it AND drive to the next location. Lesson number 2: More time between scheduled locations makes for a non-stressful operation. Smack dab in the middle of Falls City I found a vacant area on a small raise in which to park and operate from grid square EL08xx. I was about 15 minutes late in beginning this operation and probably should have “shopped around” for a higher, unobtrusive point but I knew that it would take another 30 minutes to find one so I opted to stay there. Mistake! I should have spaced apart the scheduled operating times so I could have found one because contacts were few and far between. Height makes might in VHF. Not only that, having NOT packed one of my operating canopies, I stayed out of the sun, which was now in full-force, by operating in the cab of the truck. Lesson number 3: Bring the damn canopy! Lesson number 4: Find the optimum spot, even if it takes time away from operating. The decreased contacts made me eager to make up time by breaking down earlier to move on to the next location. Driving further south on 181, I remembered a location, a covered rest stop, south of Hobson and with the sun still bearing down it seemed a wise choice to operate from. This changed my grid location sub square so it my next operating area would be from EL18aw and not EL18ax. A wise choice. An easy setup. Although you can’t tell from the picture of me operating from under the shaded picnic table I was happy again! By this time, the terrain had flattened a bit so communications were a bit easier although I started to hear lightening static on 6 meters. A bad omen? No rain gear but no rain yet! Tough it up! I was disappointed with my 6 meter contacts and although it was an experiment using an inverted “V”, next time I’ll bring either a rotating dipole or a beam for 6 meters. Lesson number 5: Bring the best you can bring, especially when it comes to antennas. It was clouding up at the time when I needed to break down from this location. I wondered what EL19aa would bring? EL19aa was a little off the main highway. 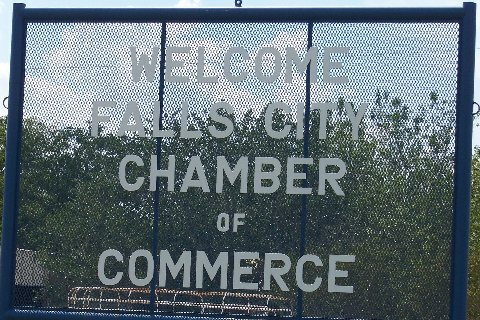 I had to back track to Falls City and then turn north east. 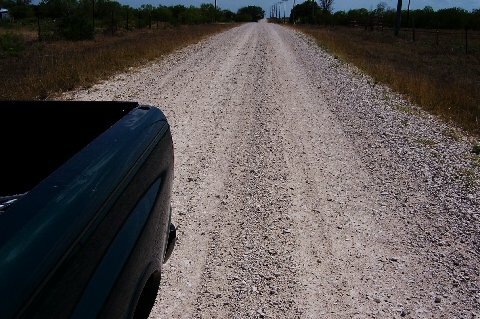 The road I chose, which I thought was a “civilized” avenue, quickly degraded first into a gravel road which wasn’t too bad, then into something which resembled a path that covered wagon trains must have taken. It was starting to get darker thanks to the clouds and nightfall. I hoped that I wouldn’t get lost or trapped in any muddy quagmire as it started to sprinkle and there was lightening to the north. Perhaps whenever we need rain I should embark on a rover event? I didn’t take pictures beyond the nicer section of road because I was too concerned about what was happening around me and had I gotten in too deep? I thought about turning around but there were no places to do so. I set up my station where I knew I was in grid square EL19aa and made some contacts, ever wary about my condition. After only about an hour, I decided that enough was enough and attempted to extricate myself from this grid square. Forging ahead, I finally reached a road with pavement! Ending up on Farm Road 81, I followed it back to RT 181 and home. Being a rover during this event was a tough, yet interesting experience. My new telescoping mast worked perfectly. The antenna on 6 meters needs to be replaced with a more effective one. I operated on deep-cycle battery power and this was quite adequate. The next attempt at being a rover will probably be during the ARRL VHF QSO Party on September 26th and 27th, at which time I will be better prepared and hopefully it will be a bit cooler.